For full details of all Emergency Orders that have been issued this year, click on the links in the “Kodiak EO’s” box, above. Effective June 1, in the Ayakulik River drainage, king salmon sport fishing is restricted to catch and release. All king salmon caught must be released without being removed from the water. In addition, bait is not allowed for any sport fishing and only single hooks on artificial lures may be used. Effective June 1, in the Karluk River drainage, including Karluk Lagoon, sport fishing for king salmon is closed. In addition, the use of bait is prohibited for all sport fishing downstream of Karluk Lake. Effective June 1, Monashka Creek and Bay are closed to sport fishing for king salmon. In addition, the use of bait is prohibited in Monashka Creek. Remember there are new regulations for rockfish: The bag limit for rockfish in Chiniak and Marmot Bays has been reduced to 3 per day, 6 in possession, only 2 of which may be non-pelagics (4 in possession) and only 1 may be a yelloweye (2 in possession). See the 2018 Southwest Alaska regulations booklet for a detailed map of the affected area. In anticipation of relatively poor returns in 2018, sport fishing for king salmon Karluk River drainage (including Karluk Lagoon) will be closed beginning June 1. In addition, the use of bait for all sport fishing is prohibited downstream of Karluk Lake and single hooks must be used. Poor returns are also expected this year for the Ayakulik River king salmon run. Consequently, king salmon sport fishing is restricted to catch and release only beginning June 1. Bait is not allowed for any sport fishing during this time and only single hooks on artificial lures may be used. In recent years, returns of stocked king salmon have been poor to Monashka Creek, though they have been excellent at the American and Olds rivers. Poor returns are expected again this year and Monashka Creek and Bay are subsequently closed to king salmon fishing to aid in collection of brood stock for enhancement of road system king salmon runs. In addition, in Monashka Creek, bait may not be used and only single hooks are allowed. The freshwaters of Pillar Creek will be open to king salmon fishing, but the immediately adjacent saltwater’s are closed. Dolly Varden are starting their migration to the ocean for the summer. Recent fishing success has been reported in Buskin Lake and in the Buskin River. Look for areas where salmon fry congregate as dollies often feed on these as they make their way back to the ocean for the summer. Other popular spots on the Buskin include the Beaver Pond and near the upper weir site. This is an excellent time to fish our stocked lakes as rainbows are becoming more active as waters warm up and they begin to feed more actively. Visit lower elevation lakes first as fish will be more active in warmer waters. Although ADF&G currently stocks only sterile juvenile trout, some lakes with a stocking history dating to the 1950s may also contain spawning populations of adult fish. Be sure to check the local sport fishing regulations for a current list of stocked lakes as harvest of rainbow trout is only allowed in lakes that are currently stocked. Rainbows typically spawn during the month of May, and anglers wishing to avoid catching these fish should target their efforts away from flowing waters into or out of the lakes during that time. Few reports of any catches of halibut have come in so far but look to deeper waters in the 2-300 ft range or more for halibut this time of year. Few recent reports of king salmon in the saltwaters have come in lately, though this is likely due to the weather. King salmon fishing can be excellent this time of year as kings move in closer to shore. Popular spots in the spring are Kalsin Bay, Sharatin and Kizhuyak bays and in between Woody and Long islands. Black rockfish can be caught just out of the boat harbor near kelp beds along rock pinnacles and other natural or man-made structures. Rockfish are also frequently caught from shore at locations such as the outer reaches of White Sand beach and the breakwater barrier shielding St. Paul Harbor. Remember to check the current regulations for the area you intend to fish. Bag limits for rockfish have been reduced to 3 per day for pelagic rockfish in Chiniak and Marmot bays. Anglers are reminded that the lingcod season does not open until July 1. A guided sport ecotourism Dungeness crab fishery was established in Nakwasina Sound, near Sitka, AK. The deadline to register for the fishery is Friday, April 13. The board established a regulation requiring a shrimp permit for the noncommercial (sport, personal use, subsistence) harvest of shrimp. The department is currently developing the permit which will be available online and at Fish and Game offices. Anglers may continue to harvest shrimp under existing regulations until this permit system is developed. A news release will be forthcoming announcing when the permits will be available. The board established a regulation requiring a king crab permit for the harvest of king crab in all areas of Southeast Alaska. The department is currently developing the permit which will be available online and at Fish and Game offices. Anglers may continue to harvest king crab during open seasons under existing regulations until this permit system is developed. The Southeast Alaska King Salmon Management Plan was modified to allow retention of other salmon species while fishing for king salmon with two rods from October 1–March 31. In the freshwater drainages of the Sitka Sound Special Use Area, the king salmon bag limit is 10 fish, 10 in possession, no size limit, and the nonresident annual limit does not apply. The board established a regional sablefish annual limit of 8 fish for nonresidents, and harvest recording is required. The mandatory retention requirement for nonpelagic rockfish was repealed. Beginning January 1, 2020, all anglers fishing from a vessel in salt waters of Southeast Alaska will be required to have in possession, and utilize, a deep water release mechanism to return and release nonpelagic rockfish to the depth it was hooked, or to at least 100 feet in depth, whichever is shallower. All vessels will be required to have at least one functional deep water release mechanism on board and readily available for use when sport fishing activities are taking place. In all waters of Central Southeast Outside Section (CSEO), the nonresident pelagic rockfish bag limit was reduced to 3 fish, with 6 allowed in possession, no size restrictions. The spring steelhead fishing season is peaking in area rivers and streams. Fishing has been good for steelhead. Early abundance surveys indicate average run sizes, with fish spread throughout the drainages. Water temperatures have warmed a little as have air temperatures. Water levels remain low as snow-pack accumulated over the winter was below average. Generally associated with stream systems with lakes, the Sitka area has several locations with steelhead. On the road system Sawmill Creek offers the best chance at catching a steelhead, while Indian River and Starrigavin Creek provide minimal opportunity. Other steelhead streams nearby are accessed by boat or airplane and include Salmon Creek, Sitkoh Creek, and Ford Arm Creek among others. Steelhead in the Sitka management area generally enter freshwater streams to spawn during May. 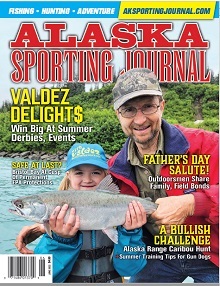 Dolly Varden, rainbow trout, and cutthroat trout can be targeted year-round but are most active in the spring months. Fishing is very good for these species right now. Fishing with lures (spinners, spoons, plugs) or flies that imitate juvenile pink salmon emigrating from local streams should produce. There are several great locations for trout and Dolly Varden fishing in the Sitka Area. On the road system the marine waters near the mouths of Starrigavin Creek, Indian River and Sawmill Creek should be productive. Most other stream mouths accessible by boat or plane should be good as well. The few reports received recently indicate king fishing is decent if you are able to get out further from town. Weather recently has allowed anglers to get out to the more popular fishing locations near The Cape and Biorka producing decent catches. King salmon fishing in most Sitka area waters should begin to pick up by the end of this month. It is still early to target halibut as most fishing is done in the summer months, however catching a halibut is still possible this time of year. Good halibut catches have been reported out at The Cape. Halibut fishing in most Sitka area waters should begin to pick up by mid to late-June. Sport fishing for lingcod is currently closed in all Southeast Alaska waters. Decreasing water levels and warming temps on the Situk have made for very good fishing. There a lot of fish moving around and large numbers of fall fish have dropped out of the lake to mix with incoming spring fish in the middle and upper portions of the river. With more rain in the forecast, it looks like stream flows will remain above average, but good fishing should continue for several more weeks with the warmer water temperatures. We are begining to see steelhead pairing up, building redds, and spawning in the middle and upper portions of the river. Anglers are encouraged to give these fish space and avoid stepping on redds as they wade the river. Sport fishing for king salmon is open in Yakutat Area marine waters and while catch rates remain fairly low, kings are being caught regularly by sport anglers in inside waters along the islands and shorelines of Yakutat Bay. Residents may use two rods when fishing for king salmon from October 1, 2018 through March 31, 2019. Residents using two rods may only retain king salmon. From January 1 through June 30, 2018 the nonresident annual limit is three king salmon, 28 inches or greater in length. Sport fishing for king salmon will be closed in the freshwaters of the Situk River begining May 1st. King salmon may not be targeted, retained, or possessed; king salmon caught while fishing for other species may not be removed from the water and must be released immediately. See the News Release issued on April 23rd for more information about this closure. Halibut fishing is just getting started, but we are seeing good catch rates. Lingcod season will start on May 16th.